Throughout history, trade routes played a central role in the transfer of goods and exchange of ideas between different parts of the world. The historic Silk Roads, which were a network of trade routes across land and sea that connected the lands from China across Asia to the Meditteranean, connected civilisations and peoples from different cultures, religions and languages with each other allowing the exchange of ideas, technical know-how and friendsip, creating a legacy of connectedness and cultural appreciation. Along the Silk Roads, many cities flourished across China, Central Asia, Arabia, India, Persia and modern day Turkey. Trade brought wealth and richness that enabled excellence in industrial process including printing, glass and paper making; medicine, philosophy, astronomy and agriculture. Cities became vibrant centres attracting intellectual polymaths and leaving a huge and fascinating mark on the consciousness of history. Location: Xi’an is a major Chinese city. Formally known as Chang’an, it is an ancient imperial capital that saw the first Chinese missions leave to south-east Asia, central Asia and the Mediterranean marking the beginings of the Silk Road under the Han Dynasty in 141-87 BC (source). Importance: From the 4th century onwards, Chang'an was the capital city of the Chinese Empire, and entered its greatest period of development under the Tang Dynasty (618-904) and became one of the most civilised cities in the world. “At the height of its glory in the mid-eighth century, Chang’an was the most populous, cosmopolitan, and civilised city in the world” (Richard B. Mather, forward to Xiong). 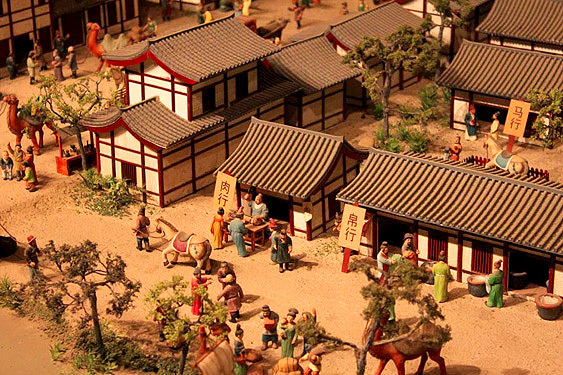 The Tang Dynasty West Market Museum is a privately-run museum in Xi'an and is situated on the original site of the 1000-year-old Chang'an City Tang Dynasty market (source). Chang'an Western Market: The city's western market played an important role in the trade with the West along the Silk Roads to central Asia providing a hub for traders to sell and buy goods. Among the dominant figures in this era were Sogdian merchants from the region of Central Asia, who were vital agents in the transporting and trading of goods to China. Chang'an's Great Mosque: The mosque still stands today and reflects how, uder the Tang (then later revived by the Ming), the city boasted an atmosphere of tolerance and was a key religious centre home not only to Buddhism and Taoism but also Zoroastrianism, Manichaeism, Nestorian Christianity and Islam. Chang'an's Great Mosque’s (the Qingzhen Dasi) visible architecture dates from the late Ming period, although it was first built in 742. It’s located close to the western market that played an important role in th trade with the West along the Silk Roads (source). Silk Road Cultural Street is situated at the original site of the Tang Dynasty West Market which thrived more than 1000 years ago in Chang'an City in the Tang Dynasty (source). Location: An amazing city at the heart of Central Asia.. an important city on the Silk Roads strategically located between China and the Mediterranean. Importance: For centuries it'd been a city of trade, renowned for its craft production and scholarly studies. Historical records show that from as early as the Han times (206 BC-220 AD), Samarkand's merchants reached various places as far as China in order to trade precious metals, spices and cloth (Source). Then later, during the time of Tamerlane, Samarkand thrived as a great city when he made it his capital at the end of the 14th century. Central high street: One of Tamerlane’s achievements was to build a central high-street with shops to encourage trade and the development of merchant economy as part of his plans of making the city a global centre. (Source). Samarkan’s Observatory: Tamerlan’s grandson Ulughbeg, who was a great scientist, developed Samarkand as a scientific and cultural centre. He was keen to surround himself with scholars to debate scientific questions with him. In 1424 he founded one of the greatest observatories in Muslim civilisation (Source). It was a monumental building equipped with a huge meridian which became the symbol of the observatory. Famous Scholars: As a cultural and prosperous hub, Samarkandencouraged and attracted prominent scholars including 15th century Al-Kashi who devoted himself to astronomy and mathematics and was invited by Ulugbeg to join him at his school of learning in Samarkand together with some 60 other scientists like Qadi Zada who was also an accomplished astronomer and mathematician. Location: Strategically situated between the eastern mediterranean cost and the Euphrates Valley at the crossroads of several trade routes since the 2nd millennium B.C., Aleppo stands out as one of the key centers along the legendary Silk Roads. Importance: Aleppo is one of the oldest continuously inhabited cities in the world, and has been an enlightened centre of trade and industry over the centuries. The Citadel and Mosque: Overseeing the city of Aleppo from the top of the hill is the prominent citadel which is an important landmark. The city is also home to a beautiful grand mosque originally built by an Umayyad Caliph in the 8th century and later altered several times. The Bazar: The renowned Bazar extends over 13 km long. It has been the core of the city’s economic and social life for hundreds of years. Up until recent history, each part of the Bazar bore the name of trades or products such as the Wool Souq, the Copper Souq, the Tailor’s Souq, the Spice Souq etc. Various Khans (caravanserais) like Khan Al Harir and Khan Al Sabun and hammams supported this bustling Bazar through offering services to traders and travellers from around the world. Location: Once a fourishing industrial and commercial city, Mosul, in today’s Northern Iraq and the north's major center for trade, industry and communications, was once a thriving city on the Silk Roads. the metropolis of this region. It is a splendid city, beautifully built; the climate is pleasant, the water healthy. Highly renowned, and of great antiquity, it is possessed of excellent markets and inns, and is inhabited by many personages of account, and learned men; nor does it lack a high authority in the Traditions, or a celebrated doctor of the law. From here come provisions for Baghdad, and thither go the caravans of al-Rihab. It has, besides, parks, specialities, excellent fruits, very fine baths, magnificent houses, and good meats: all in all the town is thriving." Importance: Under the Abbasid Muslim dynasty, Mosul became a major economic hub on the Silk Road. From that point forward, Mosul continued to develop incredibly advanced techniques in the arts and fine goods production. It has given its name to the fine textile "Muslin". Crude Oil Production: Sources record crude oil production in Iraq where there were seepages on the eastern bank of the Tigris along the road to Mosul. Muslim travellers reported that it was produced on a large scale and was exported. Textile Production: Mosul has always been celebrated as a weaving centre producing the finest of textiles. It's textiles were especially famed. Famous Scholars: Those included the philosopher Bakr Kasim Al-Mawsili who authored an epistolary philosophical work entitled Fi’ al-Nafs; the 10th century astronomer and mathematician Al-Qabisi; and the infamous Opthalmologist Ammar Al-Mawsili. Location: Merv, was a major oasis-city in Central Asia, on the historical Silk Road, located near today's Mary in Turkmenistan. 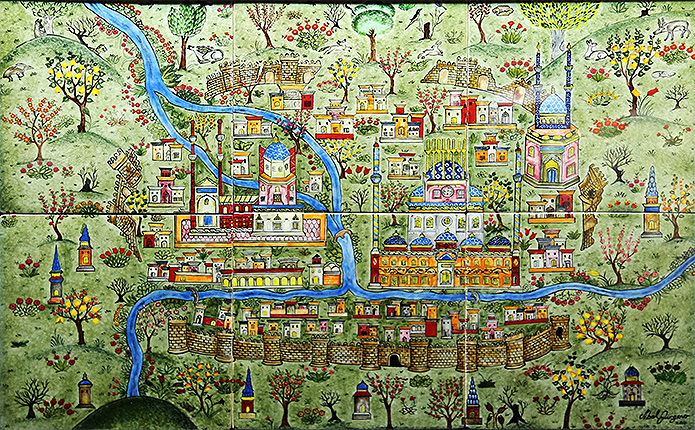 In the early Islamic period, Merv was the capital of the province of Khorasan, and in the 12th century it was the largest city in the world. Importance: Under the Abbasids, Merv continued to be the capital of the East. The great prosperity of Merv belongs to the period dating from the 8th to the 13th century. By the 11th century, Merv was a great commercial centre of the Oriental type with a bazaar, shops for artisans, money changers, goldsmiths, weavers, coppersmiths, and potters. It was an administrative and religious centre, containing mosques, madrasas, palaces, and other buildings. Textile Production: One of Merv's trademarks was its textile products, silk produced in abundance. The region was also famed for its fine cotton and exports of raw and manufactured products were sent to different lands. Merv was one of the great emporia of the caravan routes between western and eastern Asia, including to China. Famous Scholars: Merv produced one of the earliest and greatest scientists of Muslim Civilisation including Ahmad ibn 'Abdallah al-Marwazi (Marwazi means from Merv) who was an astronomer under the Caliphs al-Ma'mun; Al-Saghani, who was a mathematician and astronomer attached; and the greatest of all - al-Khazini who became a mathematical practitioner under the patronage of the Seljuk court. The dome of the mausoleum of Sultan Sanjar, one such place, was of turquoise blue, and could be seen at a distance of a day's journey away.